I think we can all admit that sometimes the items made for security purposes aren’t fashionable, or they simply aren’t items we’d tend to use in our normal lives. Money belts, fanny packs (or bum bags, depending on where you’re from) and vests with a lot of pockets scream “tourist.” Not only is this the opposite of fashionable, but it can also make you more of a target for scams and crime. We’ve featured some other travel products in the past that combine both security features while being chic, like the Speakeasy Scarves and purses for travel. But today we’d like to introduce you to the Clever Travel Companion, a company that makes pickpocket-proof undergarments. Clever Travel Companion was created originally as a line of travel underwear with pockets to store your passport and cash. The founders saw a need for such products during long term travel. 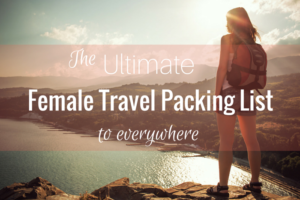 But from there, it expanded into other clothing items with pockets to prevent theft for both female and male globetrotters, including long johns, tank tops and t-shirts. My first experience with CTC products was the pair of boyshorts I received to review for our post about travel underwear. I liked the color and style, but found the fit to be a bit off. I did, however, use them more as bloomers than underwear, especially during my trip to Oktoberfest when I needed to keep cash and my ID without carrying a purse. It’s harder to find tops that can keep items safe while still being easy for you to access. Bra stashes and neck pouches can stick out and you have to go to a private place to get the money and cards out of it. Thankfully, CTC has thought of that as well. They make t-shirts in fitted and looser styles in crew and V-necks as well as tank tops. Both styles come with zippered pockets that are either on each hip or in the center under your chest. Hidden pocket leggings are also an option from Clever Travel Companion. Caroline in her Clever Travel Companion T-Shirt, size medium. 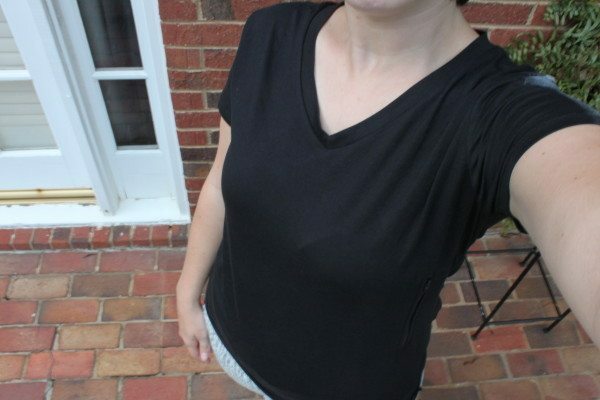 I tested out the V-neck fitted shirt with the two side pockets in black. I am a lover of solid colored t-shirts, so I was pleasantly surprised at the fit of the Clever Travel Companion t-shirt. They’re made of stretchy cotton like the ones I usually wear from Old Navy and are comfortable enough to wear even when you’re not traveling. 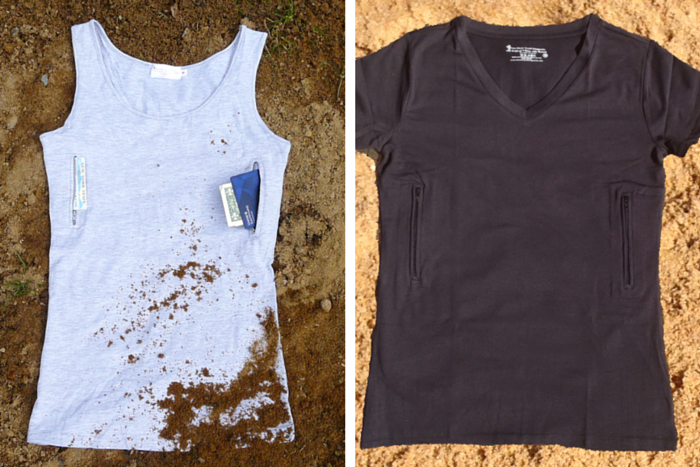 Phone in the Clever Travel Companion V-Neck Tee. The pockets point backwards so whatever is inside isn’t poking out of your belly. I was also pleased to see that the items aren’t obvious at first glance when inside. The shirts come in four colors and seven sizes. The CTC shirt is great for runners, as the pockets can hold your keys and phone. Brooke in her Clever Travel Companion Tank, stashing a passport. Size medium. Brooke Speaking: I’ve worn my Clever Travel Companion Tank several times now, and I can definitely see the value of one of these when you travel. It’s a comfortable cotton tank, with a little bit of stretch that sits on the form-fitting side. My particular tank has two zipper pockets that sit on the sides of the rib cage. When not in use, the tank top is pretty much normal looking, but given its more form-fitting style, it’s harder to hide bigger items in the pockets without seeing the bulk. However, if you wear the tank as a base layer, underneath another top, then it works perfectly! I’m able to fit a passport in the pocket in an upright position, and the pockets stretch across towards the back, which is definitely better than it bulking up the front. You can also see me wearing it in the dressy sweatpants review. Overall, very handy items to have in your arsenal. The Clever Travel Companion leggings have 2 secret pockets. Clever Travel Companion’s leggings are similar to their underwear, made of soft, stretchy cotton blend (48% cotton, 47% Modal, 5% spandex), but are also a versatile travel item. The black leggings have two pockets on the thick waistband, one on the front and the other on the hip. You can place essentials like your passport, keys, money and phone in these pockets. Just don’t overload them, as they will stick out, showing that they’re there, and will weigh down your pants. Follow the sizing information carefully, as I ordered too big. Keep in mind that the leggings will not only stretch, but may also be weighed down by the items in the pockets. Measure your hips and inseam against the website information for best results. I also wish the waistband was thicker so that it would rise higher on my hips. But with that said, they haven’t shown signs of pilling, despite constant wear, unlike other pairs I’ve owned. If you get the right fit, this might be the only pair of leggings you’ll ever pack. >> Read more about leggings for female travelers. The Clever Travel Companion range of products are great for travelers, whether you’re looking to keep items safe while on that round-the-world trip or just a basic top to wear at home. And good news for our international readers: they ship worldwide! 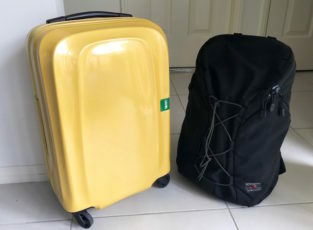 >> Check out the Clever Travel Companion products on Amazon. Please note that we are Amazon affiliates, and at no additional cost to you, we will earn a commission if you decide to make a purchase. Whoa! These are so amazing! What iPhone is that shown in the v-neck review? How big of a phone would fit? Hi Adora- I’ll have to check with Caroline. It was an iPhone 5S! where can I purchase these travel shirts?